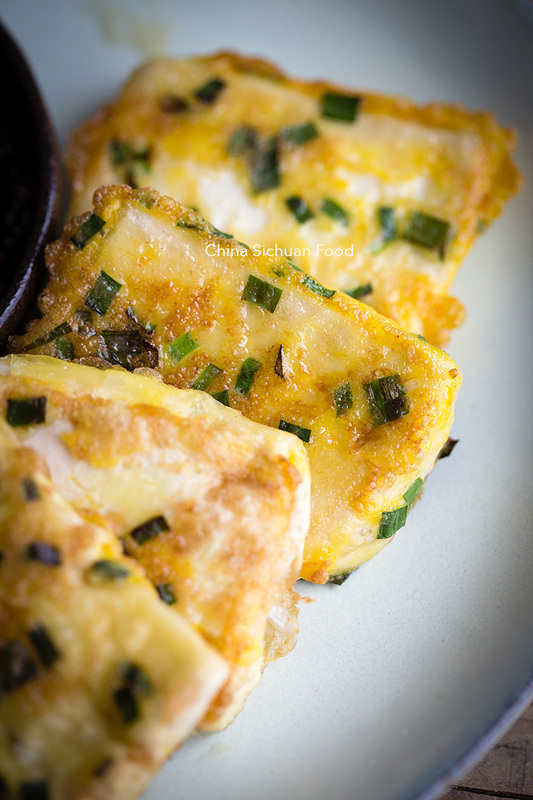 Easy pan-fried tofu with egg and chive-a creative way to enjoy tofu. 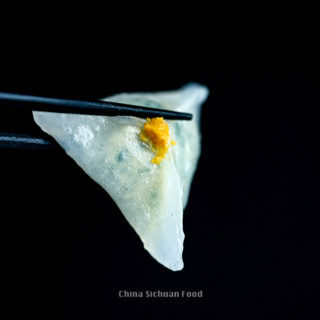 In China, there is a famous dish named 蛋塌豆腐, literally mean pan-fried with with beaten egg. Elaine came across a very interesting version with some chopped chive. 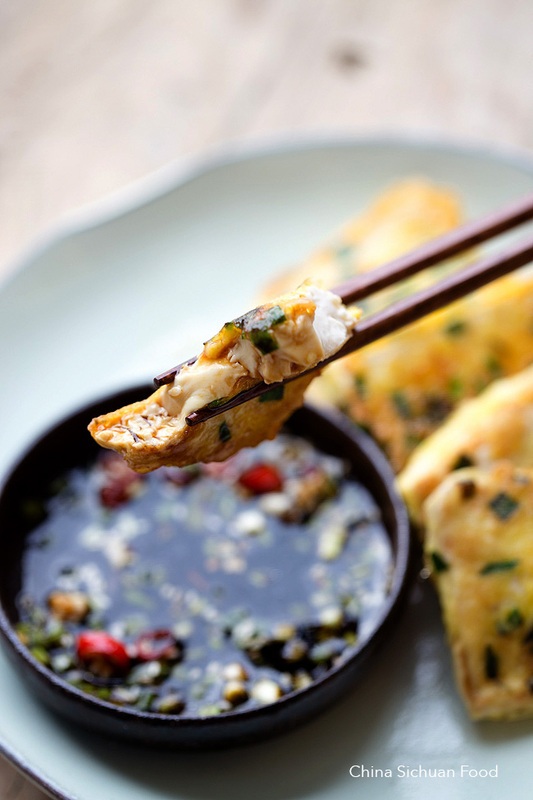 Tofu has been one of the most popular ingredients in Chinese cuisine. 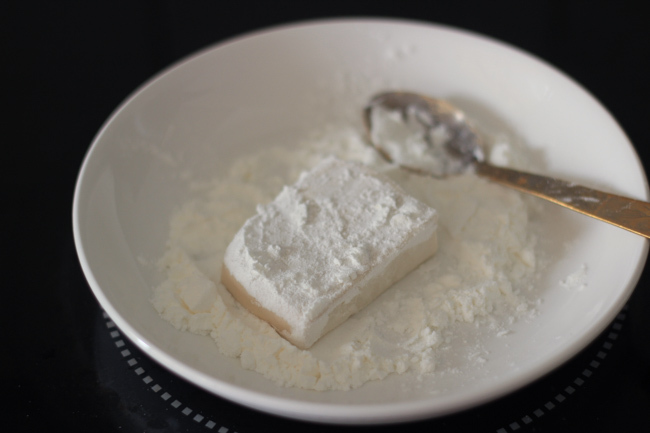 However, the embarrassing fact is that tofu is relatively hard to cook, as it cannot absorb seasonings well. 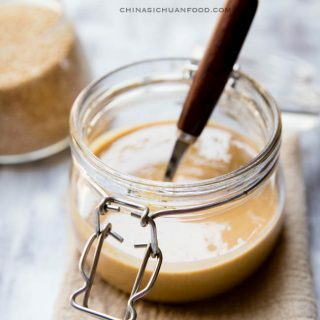 Chinese chefs use different methods to help the seasonings attaching to tofu, for example using thickeners to wrap the seasonings as in the famous Mapo tofu recipe. This is a different method but a similar concept. 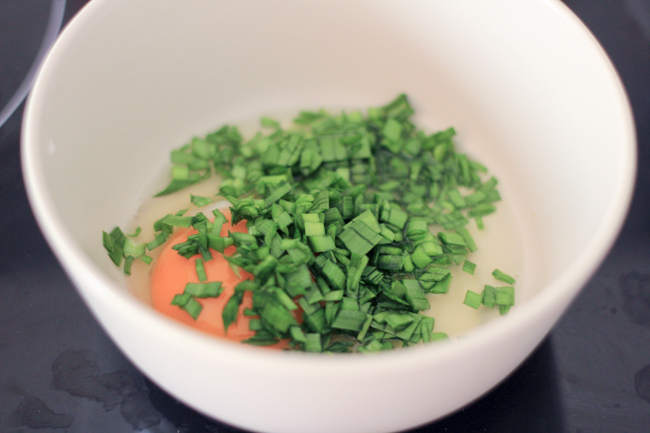 Finely chop the Chinese chives and then transfer to a small bowl. Crack an egg into it and mix well. Add a pinch of salt and pepper. 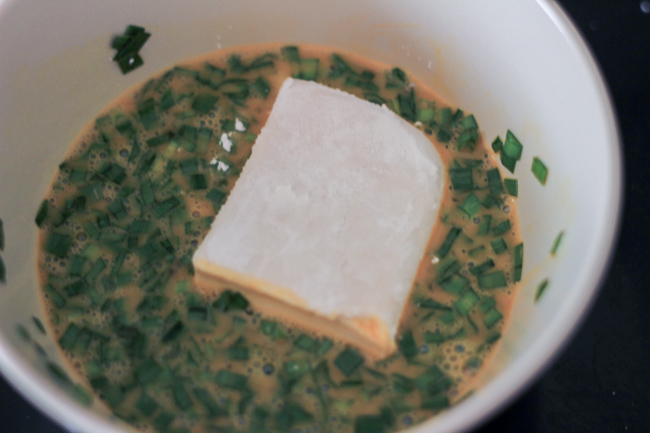 Remove the skin of the tofu and then cut the remainder into 1.5cm thick, 4 cm wide slices. Well coat it with cornstarch. 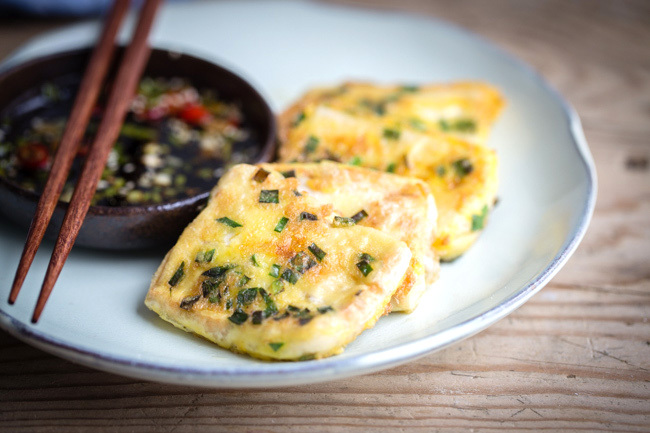 Dip it into the egg and Chinese chive mixture. Add some oil into a pan and then place tofu slices one by one(be gentle and do not break the tofu slices). Fry until two sides becomes golden brown. 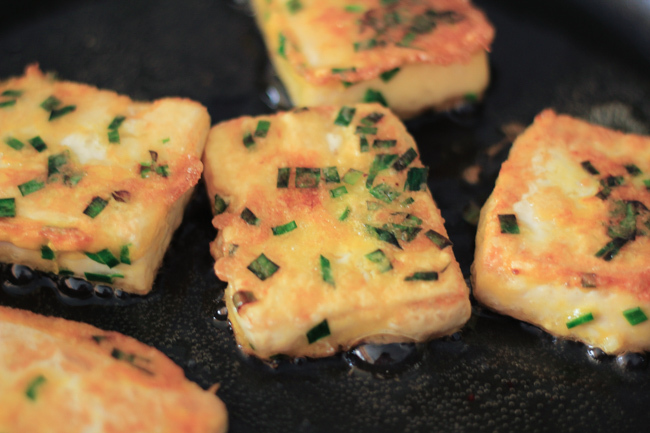 Easy Chinese pan-fried tofu with a soy sesame sauce. Remove the skin of the tofu and then cut the remaining part into 1.5cm thick, 4 cm wide slices. 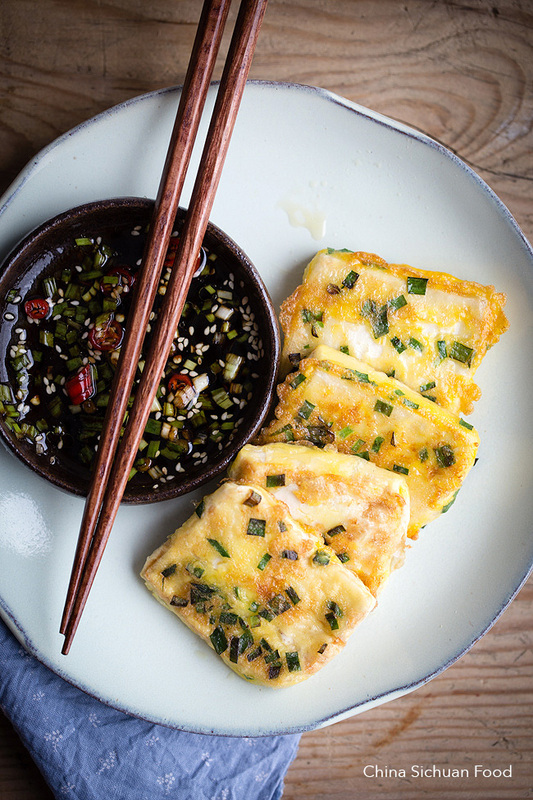 Coat the tofu slices with cornstarch and then dip it into the egg and Chinese chive mixture. Pour oil into a pan and lay the slices one by one. Turn on the heat and fry until both sides are golden brown. 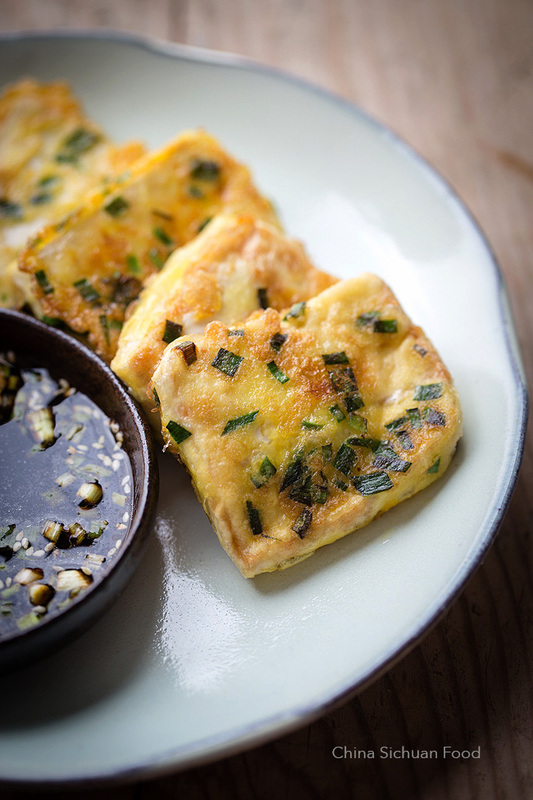 In a small dipping bowl, mix all the seasonings and serve with fried tofu. Slightly different to the regular tofu dish I cook, can’t wait to try this! I made it tonight, it is delicious!!!! 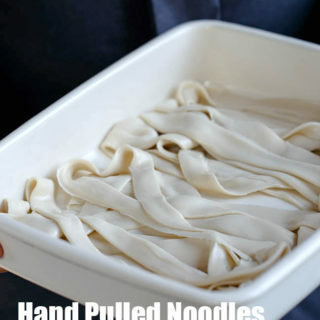 Tried this for lunch yesterday (with a salad and your smashed cucumber salad), it was really nice and so easy to make. Thank you again for your amazing recipes. It was the first time I’d tried Tofu, and because of this, I had no idea what size is ‘regular’, when I got to the asian grocer there were 3 different size boxes. 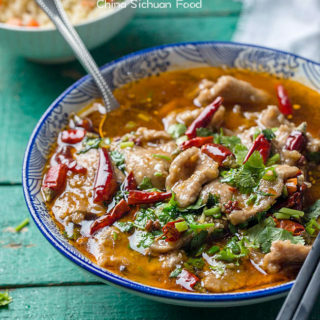 The Chinese lady in the shop advised me to drain the tofu, then lower it into boiling water for 20 seconds to remove a taste or odour (I didn’t totally understand her), so I did, and it wasn’t difficult, is this something you would recommend? is this because it’s been sitting in fluid for a while? 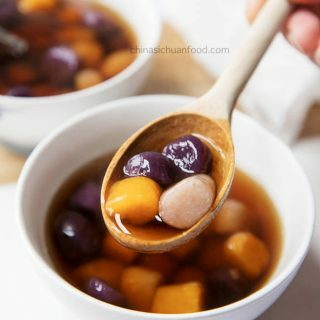 In your above recipe, you suggest cutting the tofu into 1cm pieces, but in another part of the recipe you suggest 1.5cm, I tried both, the 1cm pieces seemed to absorb more of the flavour of the dip, but the 1.5cm pieces seemed softer & lighter, both were really nice in slightly different ways. Haha, I know what she is talking about. 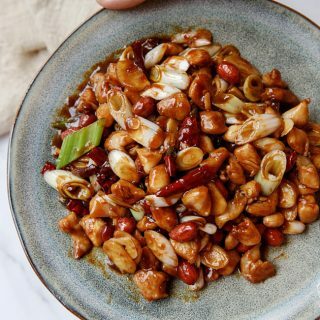 For most Chinese, tofu has a very original taste of soy beans. We call this type of taste 豆腥味. Some people really do not like it and common dealing ways are to cook them in boiling water or soak in slightly salted water. Thanks for the feedback. Happy cooking in summer. Hi, sorry if it sounds like a silly question but what do you mean by removing the skin of the tofu? If you are using store-bought tofu packaged in boxes, skip this. Some of the self-made tofu sellers make tough skins. Moving the tough skins can make the tofu slices much tender. 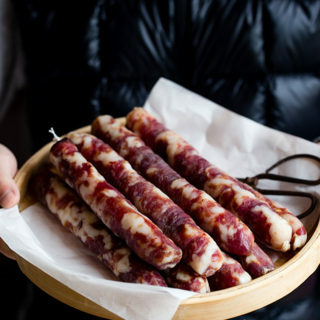 I know this is an older post, but I just finally made this recipe and it is delicious! I am currently pregnant and my nutritionist wants me to eat as much tofu as possible for the calcium content. 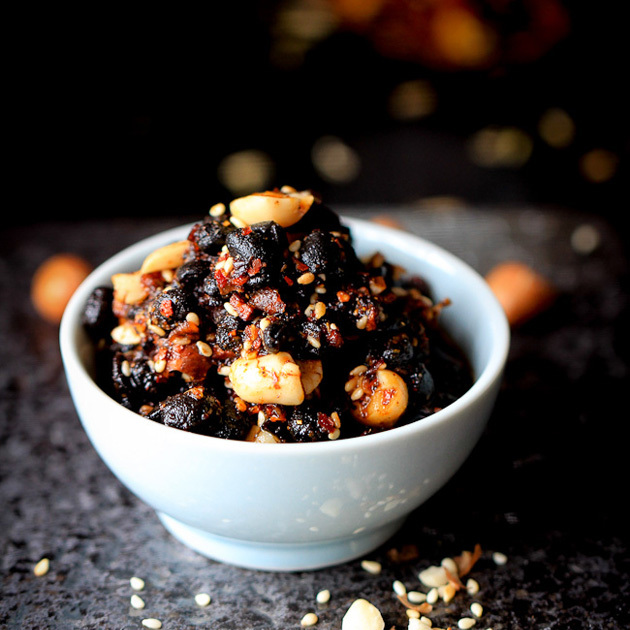 So, I am very thankful for this simple recipe! Great work, Elaine! Thanks Sarah for this lovely comment. I am so happy that you loved it. 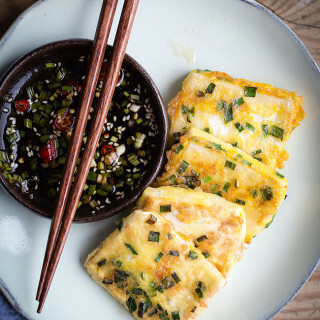 I get lots of wonderful tofu recipes on the site. Happy cooking! Exactly the tofu recipe I’ve been looking for! It will definitely be a regular in my household. Thank you, Elaine! 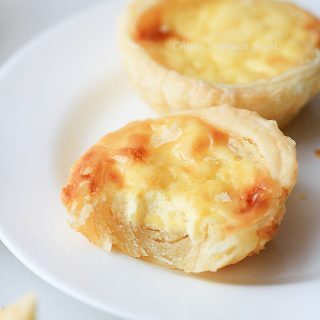 Any tips on getting a crispier crust? I possibly didn’t use enough oil in the pan, was trying to keep it from being greasy. In that case, simply fry your pan hotter and let the tofu stay for a longer time. I’m going to try this in an air fryer to avoid the grade nearly entirely. Hi Elaine will be cooking this for breakfast tomorrow for my girlfriend, sounds tasty and easy. Could you please tell me what type of “oil” you use for frying thus dish? 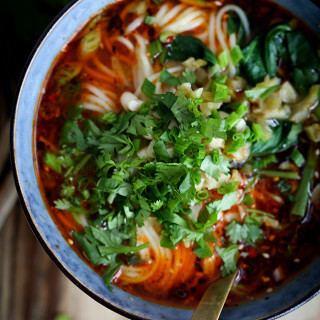 PS: I’m cooking your “Sichuan Beef” tonight. In most cases, I use sunflower seed oil in my kitchen. But I change from type to type, so cannot figure out the exact one. I love smoking Boston butts to make barbaque and would love learning to make Char Siu Bao (pork buns). Can you guide me ? You can follow this one.